On November 8, 2018 (last Thursday), Microsoft released v1.7.0 of the SharePoint Framework (SPFx). This release is filled with a lot of new things Microsoft has been talking about for a few months. In this post, I’ll summarize some of what you can find, but also share some disappointments I had after spending some time picking apart v1.7.0. A new @SharePoint Framework Yeoman generator has been published by @OfficeDev: 1.7.0 #SPFx @Office365 !!! There are two things to do to get your developer environment updated for v1.7.0. The first one is to upgrade the version of the SPFx Yeoman generator. The second step is to upgrade your individual projects to v1.7.0. There are a few ways to do this. You can use the Office 365 CLI’s project upgrade command. Execute this command from within a command prompt when you are in the project’s root folder. Regardless of the method, I recommend you delete the node_modules folder in the project, as well as any package manager lock files such as package-lock.json (NPM), yarn.lock (Yarn) or shrinkwrap.yaml (PNPM). Then rerun the install process for the package manager you use to get all the updated packages. This way you know you have a clean set of the latest versions. Of course, test your project before rolling it out. I spent a few hours poking around, picking the latest version apart & trying a few things out. While all these new developer preview features are quite welcomed (and I’ll get to those in a minute), what I like to focus on is what made it to the GA milestone that’s currently supported and what things were fixed. Unfortunately, after a few hours the excitement of a new release wore off pretty quick. 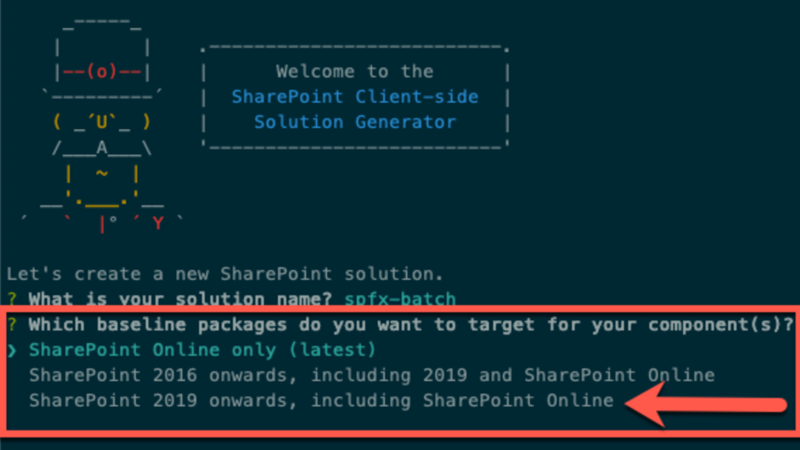 While there are two new GA features, only one is something we’ve been waiting on (dynamic data) while the other adds the ability to create SPFx projects for SharePoint Server 2019 that was recently released. With any new release, there are two sides to it: what’s new and what’s updated/fixed? It’s the latter part that leaves me a bit disappointed. The focus on this release was developer preview features… not squashing long time bugs or updating versions of things we are dependent on. You’ll see two changes right away when you run the generator. The other is a question about a new developer preview feature related to isolated web parts. I’ll address this feature come back to this in the Domain Isolated web parts section of this post. I find it strange that a developer preview feature is showing up in the generator when I didn’t say I wanted developer preview stuff in this project by specifying --plusbeta when I ran the generator (ref: Try SharePoint Framework preview capabilities). Another interesting thing is after creating the project, you’ll see a new folder in your project related to Microsoft Teams, more developer preview stuff that I’ll address later: Teams tabs & apps in SharePoint. Again… I don’t understand why this is here when I didn’t specify --plusbeta. Eventually, you’ll want this, but its developer preview. I guess it doesn’t matter if you aren’t doing anything with Teams at this point. One welcomed update that came in the SPFx v1.7.0 release is upgrading the React version SharePoint is using. Previously we were on React v15.6.2 which is quite old, released over a year ago in September 2017. Now when you create an SPFx project & select React as the web framework, it targets v16.3.2 released in March 2018. That’s a nice update, but I do hope we see more frequent updates now that we’re on the v16 branch as Facebook is dropping new minor versions that include bug fixes almost every month or two (as of writing, the latest release is v16.6.1 which was released just this week and before that, v16.6.0, was released a few weeks prior and the minor version before that, v16.5.0, came out in early September). Hopefully, the SPFx team can do this going forward as rev’ing minor releases aren’t as significant as a major release rev. Unfortunately, on the topic of React is not a complete win. Many people have been waiting for an update to the version of Fabric React. Before SPFx v1.7.0, the version of Fabric React supported by and included in the SPFx project was v5.120.0. While that’s version was released fairly recently (August 2017), there are a lot of known bugs people have found that have been fixed in Fabric React v6.*. The challenge is that Fabric React v6 has a dependency on React v16. So… for a while, we were stuck on Fabric React v5. * because SPFx only supported React v15. You would have thought that with SPFx v1.7.0 updating to React v16 they would also update Fabric React? Unfortunately not… SPFx v1.7.0 projects are still using the v5 version of Fabric React, specifically v5.131.0. Hopefully, the next version of SPFx will bump this support. @SharePoint Framework v1.7.0 projects are still using the v5 version of @OfficeUIFabric React, specifically v5.131.0. Bummer... Fabric React v6 depends on @React v16. I would have thought updating support in #SPFx v1.7.0 to @React v16 would also bump the Fabric React version. Unfortunately, I have to continue on this theme of dependency versions. In the weeks leading up to SPFx v1.7.0, there were some expectations set to updating the version of Webpack used by the build toolchain. SPFx v1.6.0 used Webpack v3 but Webpack v4 has been out for a while and is much faster. Unfortunately, there was no change here… SPFx v1.7.0 is still using Webpack v3.6.0. As for TypeScript, there’s not much of an update here either. While the current published version of TypeScript is v3.1.6, SPFx v1.7.0 is still using TypeScript v2.4.2 which was released in July 2017. Seasoned SharePoint developers are familiar with the concept of web part connections. This is a feature, until today, that we haven’t had in the SPFx. Dynamic Data is a feature in SPFx that effectively creates a client-side service bus service that implements the pub-sub model. One SPFx component publishes data and another component can consume that data. This can be any type of SPFx component including web parts and extensions! Note that this feature is released as a developer preview, not straight to generally available (GA). Let’s switch from what you can use today in GA that’s supported and look at some of the new toys added to SPFx as developer preview features. These are things that work and are mostly supported, but you’ll undoubtedly run into unfinished parts, some bugs and expect them to change over the coming months while Microsoft moves them to the GA milestone. First up is the Microsoft Teams support. There are two developer preview capabilities in this SPFx release. The first is the ability to create Teams tabs that contain SPFx solutions (web parts). Conceptually it’s quite simple: any SPFx web part you deploy that’s accessible to the SharePoint site that backs a Microsoft Teams team can be added as a custom tab in the team. Behind the scenes, there’s a special page in SharePoint that loads the web part on the page and the Teams client displays that page. To the end user, it looks like a SPFx web part is running within Microsoft Teams. As a developer, there’s a new microsoftTeams object on the page context API within SPFx that you can leverage to get Teams-specific things. The other ability is to take provider-hosted Microsoft Teams tab solutions that you’ve created and upload that solution directly to a SharePoint app catalog. This tabs solution will then be available within SharePoint as a web part in your SharePoint pages. One of the most requested features, since SPFx was released, was the ability to host a Single Page Application (SPA) in SharePoint (ref uservoice). But an SPA doesn’t make much sense in SharePoint… if you want to take over the entire experience, why put it in SharePoint? Instead, what would make sense is a full page app which will put our app on the page but include the same suite bar header, same styles and depending on the site type, a left navigation will be present in the case of a team site, but a communications site won’t have that left nav. This is a huge addition to SPFx… one people have been waiting a long time for! SPFx customizations are rendered in a DIV within the same page context that the user is in. This means that any script added to the page can access the same SharePoint REST API using the user’s context and other resources. If you think back to the SharePoint Add-in model, customizations that were rendered on the page from a provider-hosted or SharePoint-hosted Add-in were rendered within an IFRAME and a unique domain. The advantage of this is that the custom Add-in couldn’t jump to the domain of the user and make calls on their behalf because they would be crossing domains and virtually all browsers block this for security reasons. So what’s new? In SPFx v1.7.0, you can now flag your component as something you want to be isolated from the rest of the site. What does that mean? Essentially you tell SharePoint “run this SPFx component within an IFRAME instead of a DIV”. This is a setting that the developer can set within the package-solution.json file using the new isDomainIsolated property or something the admin can set when they install the solution. This is what that second API prompt was that I referenced above when you created a new project. Last but not least is a cool feature we saw teased at the SharePoint Conference NA in May earlier this year. Using the popular technology socket.io, you can now have your client-side customization subscribe to events within a list and get notified by SharePoint when things happen without polling or refreshing the page.